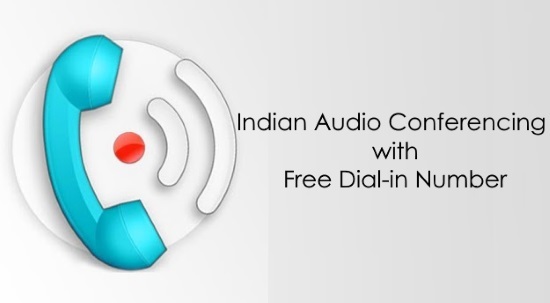 Here are 2 free online Indian audio conferencing services with free dial-in numbers. You can use them to host seamless audio conferencing sessions with your team, colleagues, etc. Using these services is pretty easy, as all you gotta do is sign up to them and then they will provide you with a free Indian dial-in number. Later, you can use this number to easily start an audio conference. One of them lets you have a conference with a whopping number of up to 1000 participants, whereas, one has a limitation of only 10 users. Apart from audio conferencing, they also come with unique features like video calls, screen sharing, file sharing, and more. There are tons of audio conferencing services available online with free dial-in numbers. But, most of them offer dial-in numbers only for the United States, Germany, Canada, etc. and not for India. 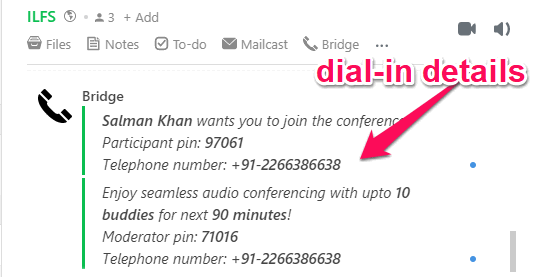 So, after spending a lot of time on the web, I have managed to find these two services which actually provides free dial-in numbers for India to do team audio conferencing. Let’s check out these Indian audio conferencing services. FreeConferenceCall is probably the best free online Indian audio conferencing service with a free dial-in number. It allows you to host high-definition audio conference sessions with up to 1000 participants for free. There is also no limit on the conference duration. When you register for this service, you will get a free Indian dial-in number that can be used for the conference. In addition to audio conferencing, you can also use this website for video conference and screen sharing. The only limit in the free version of this service is that you get only 1 GB of free storage. Step 1: To get started, simply go to the homepage of this service and then sign up for a new account. As soon as you do that, it will automatically generate the dial-in details for you. You will be given a free dial-in number, access code, and a host PIN. Step 2: Now, you’re ready to do audio conferencing for free. To start an audio conferencing, all you gotta do is call the dial-in number provided to you. Then enter the access code and then the host PIN to join and host the conference. Step 3: After that, you can share the same dial-in number with your team members and the access code. They can also make a call to the number and use the access code to join the audio conference. You can now talk with all the participants without any limit on the duration of the conference for free. Step 4: Once the conference is on, you will be able to control various aspects with phone keypad commands. For example, you can breakout rooms by pressing “*3”, record the call by pressing “*9”, and so on. You will find the full list of keypad commands here. Flock is actually one of the best free online enterprise communication tools you might come across along with Slack, Microsoft Teams, etc. That means you can use it for team chat, file sharing, video calls, and much more. Apart from all these features, they have integrated another feature called “Bridge”. This feature allows you to easily do audio conferencing with a fee Indian dial-in number. However, this feature does have some limitations. Unlike FreeConferenceCall, this one can be used to have an audio conference with up to 10 participants only and each session is limited to 90 minutes. Step 1: First, open up Flock and then login to your account. If you don’t have one create it to proceed. Once the account is created you can start inviting your team members and start chatting with them. While chatting, you will see a “Bridge” option at the top. Step 2: Now, to host an audio conference, simply click on the “Bridge” option and then it will generate the dial-in information for you. You will get a free Indian dial-in number, a participant PIN, and a moderator PIN. Step 3: To start the conference, all you gotta do is call the number provided by Flock. Then enter the participant PIN followed by the moderator PIN. This will start the audio conference and make you the host. 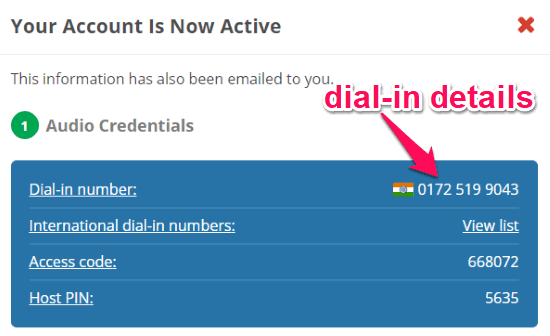 Step 4: Now, you can go ahead and share the dial-in number with your team member along with the participant PIN. They can use these information to join the conference and have a seamless audio chat with you. Do note that the session will expire after 90 minutes. So, if you have been looking for free services that provide free dial-in numbers for Indian audio conferencing, then the services explained in this post is what you need. Personally, I like FreeConferenceCall as there is no limitation on the duration of each conference session and also enables up to 1000 participants to join. But, if you have a small team and would like to do a short audio conferencing, then Flock is also a pretty good choice for that. Try these services and do high-quality audio conferencing with ease.